1. 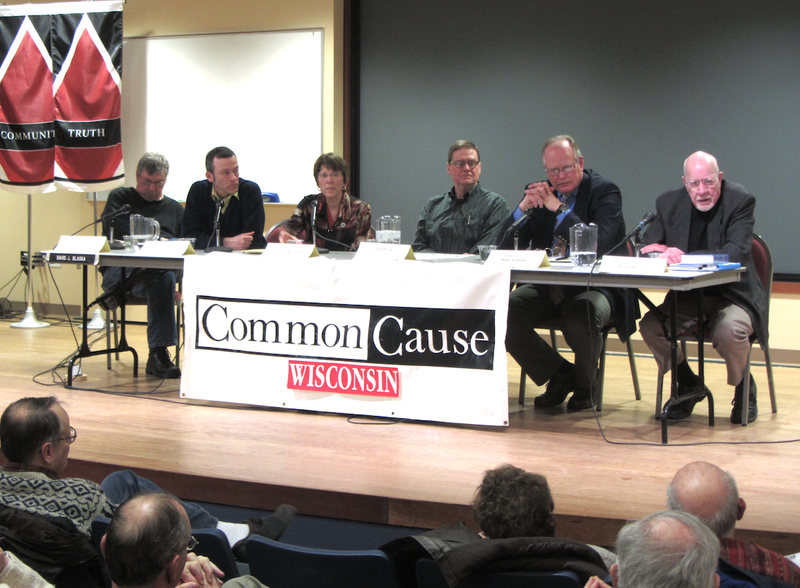 Despite periods of heavy snow and treacherous driving, 85 citizens ventured out into a cold winter Monday evening to attend Common Cause in Wisconsin's Reform Forum at Edgewood College in Madison. The diverse and opinionated panel for the event, moderated by Wisconsin State Journal Editorial Page Editor Scott Milfred, was composed of State Senators Dale Schultz (R-Richland Center), Fred Risser (D-Madison), Andrea Kaminski, executive director of the League of Women Voters of Wisconsin, Edgewood College Social Science Professor Steven Davis, Conservative blogger and activist David Blaska and CC/WI director Jay Heck. The need for non-partisan redistricting reform in Wisconsin was a focal point and was highlighted by Professor Davis' presentation of legislative and congressional district maps and statistics regarding the competitiveness of elections in Wisconsin and other gerrymandered states such as Illinois, Maryland, North Carolina, Ohio and Pennsylvania -- compared with states that have non-partisan redistricting such as Iowa and Arizona. The disastrous 2010 U.S. Supreme Court decision. Citizens United vs, F.E.C. and its effect on elections in Wisconsin was discussed, with all but Blaska asserting that it needed to be overturned. Wisconsin's extreme and restrictive 2011 voter photo ID law (Act 23) which has been enjoined by the Courts and has not been in effect, and new attempts to re-introduce it in another form as well as other possible upcoming restrictions on voting in Wisconsin were explored. Senator Schultz made news by announcing he regretted his 2011 vote in favor of voter photo ID and would not be voting for any attempts to further restrict voting during his remaining time in office. The future of elections for the State Supreme Court and whether Wisconsin ought to change the current system and move toward a merit selection system instead was debated as was whether or not Wisconsin ought to make it easier for political parties, other than the two major parties, to be able to grow and thrive. Thanks to everyone who attended the event. A video of the entire forum will be available soon for viewing by those who were unable to attend Monday evening. Stay tuned. 2. 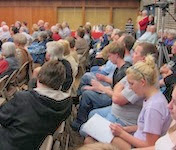 Last week's "alternative" public hearing on non-partisan redistricting reform in the State Capitol sponsored by Senator Schultz and State Senator Tim Cullen (D-Janesville) and this week's Edgewood College forum have combined to keep this issue front and center on the statewide radar screen. The number of Wisconsin daily newspapers that have endorsed this reform has, by our count, climbed to an unprecedented nineteen: Appleton Post-Crescent, Beloit Daily News, The Capital Times, The Chippewa Herald, Eau Claire Leader Telegram, Green Bay Press-Gazette, Janesville Gazette, Kenosha News, La Crosse Tribune, Marshfield New Herald, Manitowoc Herald Times, Milwaukee Journal Sentinel, Racine Journal Times, Sheboygan Press, Stevens Point Journal, Tomah Journal, Wausau Daily Herald, Wisconsin Rapids Daily Tribune and the Wisconsin State Journal. That's a big number and a powerful voice for reform in Wisconsin. Support for (or opposition to) non-partisan redistricting reform to be in place prior to the 2021 redistricting process is shaping up to be a potent political issue in the upcoming 2014 elections. Candidates opposing this reform will do so at their peril. 3. Former Wisconsin Assembly Speaker Scott Jensen (R-Town of Brookfield) was toppled from power with four other Wisconsin legislators of both political parties in 2002 in the "Legislative Caucus Scandal," the most serious political scandal to rock Wisconsin in a century. Jensen was ultimately convicted of a misdemeanor in a retrial that was moved from Dane to Waukesha County in 2010. As part of the plea deal settlement, Jensen was barred from state public office for the rest of his life. But he was not banned from being a powerful, influential lobbyist for school "choice" in Wisconsin and last week Jensen was back in the State Capitol to testify for the first time since he left elective office. 4. Former Federal Communications Commissioner and Chair Michael Copps, now with national Common Cause, was in Wisconsin last week to warn against further media consolidation, decry a recent court decision against "net neutrality" and to boost independent and local media as a necessary safeguard and vital source of information for citizens in the face of the current corporate media onslaught. A profile of Copps and his important mission were featured recently by Progressive Magazine editor Ruth Conniff which you can access here. Copps also spent an hour on statewide Wisconsin Public Radio discussing these issues when he was here and you can listen to that here. 5. For more than a year, CC/WI has been "spreading the gospel" about the urgent need to adopt non-partisan redistricting reform in Wisconsin. Next week, we take our on-going "road show" to Greenfield -- which is in the district of State Senator Mary Lazich (R-New Berlin) who, in her capacity as the Chair of the Senate Committee on Elections and Urban Affairs, has refused to even schedule a public hearing on the non-partisan redistricting reform legislation (Senate Bill 163 and Assembly Bill 185) introduced nearly ten months ago. CC/WI director Jay Heck will speak at the Greenfield Library next Wednesday evening, February 26th, during a program that begins at 6:15 PM. If you are in the area, be sure to attend for what promises to be an interesting evening. Full details are here. This Monday night, we hope to further build the momentum in support of non-partisan redistricting reform – and other vital political reforms – by bringing together members of the Legislature, reform experts, and Wisconsin citizens at a free public forum in Madison at Edgewood College. The event will run from 6:30 to 8 PM and will include a lengthy Q&A with the audience. Why should area citizens attend this forum? In 2011, Wisconsin experienced the most secretive, partisan and expensive (at over $2 million) redistricting process in state history – resulting in dramatically less competitive State Legislative and Congressional districts. We'll talk about why a measure that takes redistricting out of the hands of partisan legislators and puts that process into the hands of a non-partisan entity should be put into place now – for the next redistricting process that will occur in 2021. Tens of millions of dollars were spent in Wisconsin by outside special interest groups for largely negative communications leading up to the 2012 general election. But Wisconsinites are still in the dark about who was really behind much of this avalanche of “outside” campaign cash and the constant barrage of “phony issue ads” during the election. On Monday, panelists and audience members will explore whether this lack of disclosure of these anonymous communications is a form of protected "free speech" – or if citizens should have the right to know who is trying to influence their vote. We will also discuss Wisconsin’s 2011 photo voter ID law – one of the most extreme and restrictive such measures in the nation. It has been blocked by the courts, but may return in a new form soon. Is requiring a photo ID at the polls needed? Is there really voter fraud or is this a voter suppression measure? And, we will look at the U.S. Supreme Court’s disastrous 2010 decision in Citizens United vs Federal Election Commission which allows corporations, labor unions and other interest groups (and their "Super PACs") to use unlimited money from their general treasury coffers to flood our airwaves with negative messages, giving them far greater influence on the outcome of elections. 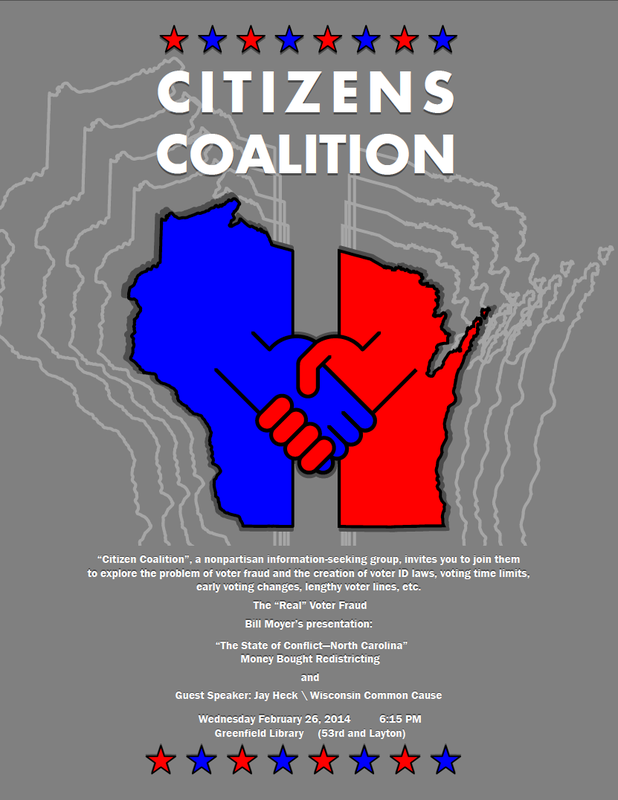 Attendees will learn more about how the Citizens United decision has affected Wisconsin and why it matters. Scott Milfred, Editorial Page Editor of the Wisconsin State Journal will serve as Moderator. Please join us for what will be an informative and lively discussion. In the wake of Wisconsin Assembly Speaker Robin Vos' arrogant and out-of-touch assertion last week that "nobody cares" about the hyper-partisan, secretive, and expensive redistricting process currently in place in Wisconsin, nearly 100 "nobodies" packed a large Capitol hearing room and overflow room this past Monday – on a frigid morning with temperatures hovering around zero outside. To hear State Senators Dale Schultz (R-Richland Center) and Tim Cullen (D-Janesville) take testimony from experts from Iowa on their redistricting process that we seek to emulate, as well as from UW-Madison redistricting experts and political science Professors David Canon, Ken Mayer and Common Cause in Wisconsin Chair Bill Kraus (pictured from left to right), and CC/WI board member and former Republican State Representative Dave Martin – and from dozens of citizens and some legislators from all over Wisconsin who testified and registered in support of reform and for Senate Bill 163 and Assembly Bill 185. No one testified or registered against this "no-brainer" reform. Speaker Vos has it totally wrong. What he should have said is: "Nobody but me, and a few of my hyper-partisan colleagues and special interest allies, don't support ending gerrymandering." all of the citizens of Wisconsin." 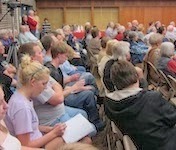 Monday's meeting was a terrific "alternative" public hearing. If you could not attend, it is worth watching and you can do so at Wisconsin Eye here. The testimony of Bill Kraus starts at 01:09:10; Dave Martin's testimony begins at 01:17:00. Tuesday's Wisconsin State Journal editorial leads off with Dave Martin's wise counsel to his fellow Republicans. Widespread media coverage of the hearing included this from Wisconsin Public Radio. 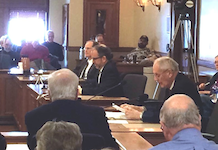 Building on the momentum and enthusiasm generated at Monday's hearing, CC/WI will hold another in its continuing series of "reform forums" around Wisconsin where redistricting reform will be a front and center issue. This forum will take place this coming Monday evening, February 17th from 6:30 to 8:00 PM at Edgewood College in Madison. State Senator Dale Schultz will be a panelist, as well as State Senator Fred Risser (D-Madison), Edgewood College Professor Steven Davis, League of Women Voters of Wisconsin executive director Andrea Kaminski, and CC/WI director Jay Heck. Scott Milfred, the editorial page editor of the Wisconsin State Journal will moderate the event. Any and All Citizens of Wisconsin are invited to testify as well. 1. 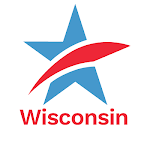 Wisconsin's current legislative leadership: State Senate Majority Leader Scott Fitzgerald (R-Juneau) and Assembly Speaker Robin Vos (R-Rochester) continue to forbid the chairs of committees with jurisdiction over redistricting reform legislation (Senate Bill 163 and Assembly Bill 185) to schedule even simple public hearings on the issue. 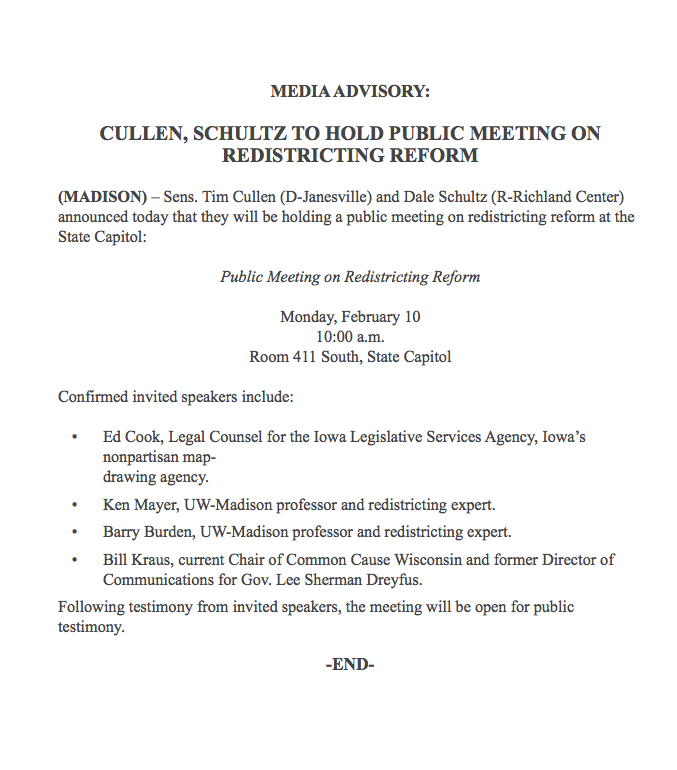 But two other legislators have announced that they will hold their own public hearing on non-partisan redistricting reform on Monday, February 10th beginning at 10:00 AM in Room 411-South of the State Capitol Building in Madison. 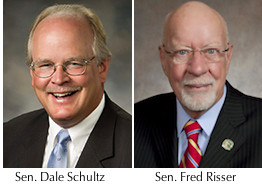 State Senator Dale Schultz (R-Richland Center) and State Senator Tim Cullen (D-Janesville) will hear invited testimony from experts from Iowa -- where non-partisan redistricting has been in effect since 1981. Two Wisconsin redistricting experts from the University of Wisconsin-Madison (Professors Barry Burden and Ken Mayer) will testify, as well as CC/WI Chair Bill Kraus, a former Republican strategist and top adviser to former Republican Wisconsin Governor Lee Sherman Dreyfus. The public is also invited (and encouraged) to attend the public hearing and testify. This is an opportunity for the citizens of the Madison area and beyond to express their views about the current, hyper-partisan, secretive and expensive redistricting process in this state and why it should be changed. For full details about this "must attend" (if you can) event, go here. 2. 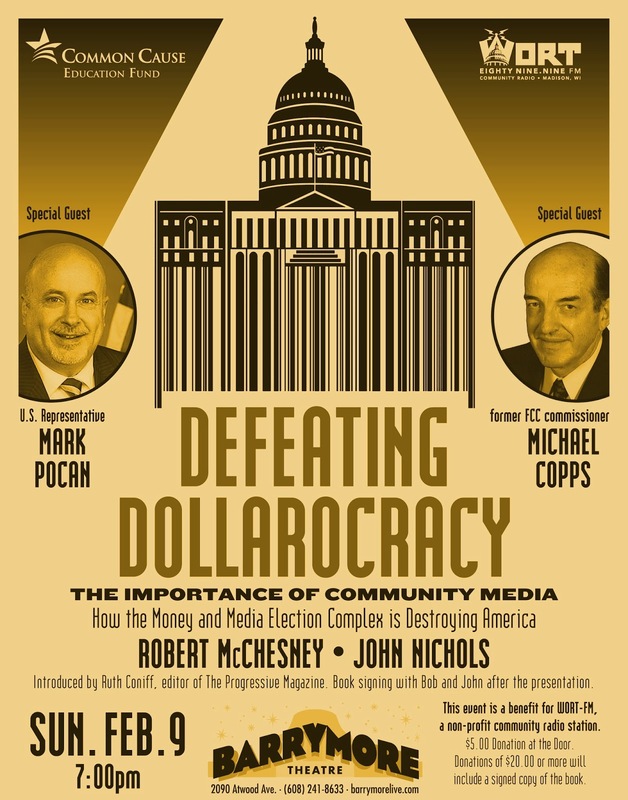 Also Next Sunday evening and Monday morning, the former Chair and Commissioner of the Federal Communications Commission, Michael Copps will be in Madison. He will address critical issues such as media consolidation, net neutrality and the importance of independent and local media. You can go see and hear Copps speak at this event, and/or hear him speak about critical media issues on statewide Wisconsin Public Radio on the "Ideas" Network with Joy Cardin from 8:00 AM to 9:00 AM on Monday morning, February 10th. 3. But wait.... there is more! 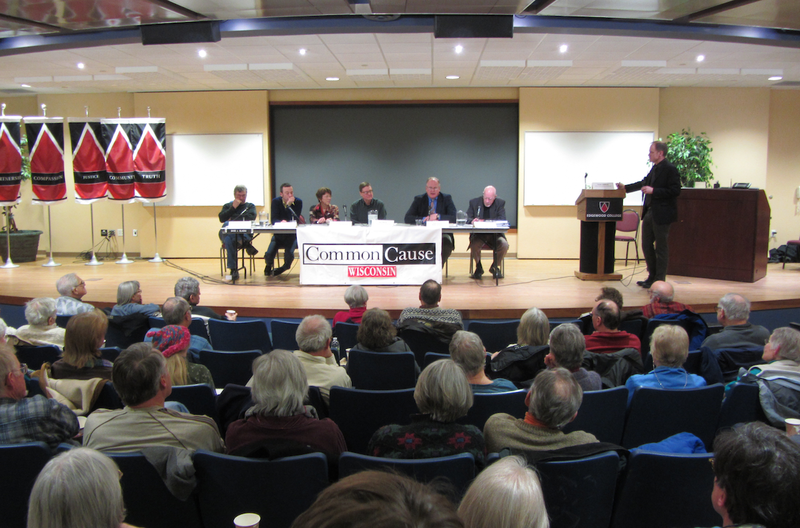 The following Monday, February 17th, CC/WI has organized another in our series of "reform forums" on redistricting and other needed political reforms. Panelists at this event at Edgewood College from 6:30 to 8:00 PM include retiring Republican State Senator Dale Schultz of Richland Center, as well as Madison's State Senator and the longest serving state legislator in the United States, Democrat Fred Risser. The forum is free and open to the public to attend and participate. Full details are here.